This article is about the field of study. For television channel of the same name, see Military History (TV channel). For the book by John Keegan, see A History of Warfare. The essential subjects of military history study are the causes of war, the social and cultural foundations, military doctrine on each side, the logistics, leadership, technology, strategy, and tactics used, and how these changed over time. Whereas Just War Theory explores the moral dimensions of warfare, and to better limit the destructive reality caused by war, seeks to establish a doctrine of military ethics. An important recent concept is the Revolution in Military Affairs (RMA) which attempts to explain how warfare has been shaped by emerging technologies, such as gunpowder. It highlights the short outbursts of rapid change followed by periods of relative stability. One military historian, Jeremy Black, in a recent work mentioned some problems 21st century military historians face as an inheritance of their predecessors: Eurocentricity, a technological bias, a focus on leading military powers and dominant military systems, the separation of land from sea and recently air conflicts, the focus on state-to-state conflict, a lack of focus on political "tasking" in how forces are used. If these challenges were not sufficient for the military historians, the limits of method are complicated by the lack of records, either destroyed or never recorded for its value as a military secret that may prevent some salient facts from being reported at all; scholars still do not know the exact nature of Greek fire for instance. Despite these limits, wars are some of the most studied and detailed periods of human history. The documentation of military history begins with the confrontation between Sumer (current Iraq) and Elam (current Iran) c. 2700 BCE near the modern Basra, and includes such enduring records as the Hebrew Bible. Other prominent records in military history are the Trojan War in Homer's Iliad (though its historicity has been challenged), The Histories by Herodotus (484 BCE – 425 BCE) who is often called the "father of history". Next was Thucydides whose impartiality, despite being an Athenian, allowed him to take advantage of his exile to research the war from different perspectives by carefully examining documents and interviewing eyewitnesses. An approach centered around the analysis of a leader was taken by Xenophon (430 BC - 355 BC) in Anabasis, recording the expedition of Cyrus the Younger into Anatolia. The records of the Roman Julius Caesar (100 BCE – 44 BCE) enable a comparative approach for campaigns such as Commentarii de Bello Gallico and Commentarii de Bello Civili. Chariots, pulled by animals like the onager, ox, donkey, and later the horse, originated around 2000 BC. 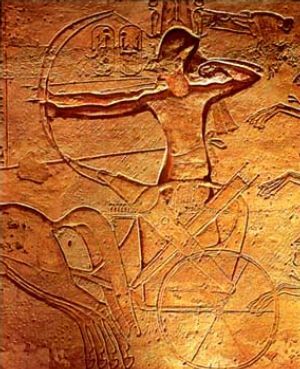 The chariot was an effective, fast weapon; while one man controlled the maneuvering of the chariot, a second bowman could shoot arrows at enemy soldiers. These became crucial to the maintenance of several governments, including the New Egyptian Kingdom and the Shang Dynasty and the nation states of early to mid Zhou dynasty. For settled agrarian civilizations, the infantry would become the core of military action. The infantry started as opposing armed groups of soldiers underneath commanders. The Greeks and early Romans used rigid, heavily armed phalanxes. The Macedonians and Hellenistic states would adopt phalanx formations with sarissa pikemen. The Romans would later adopt more flexible maniples from their neighbors which made them extremely successful in the field of battle. The kingdoms of the Warring States in East Asia also adopted infantry combat, a transition from chariot warfare from centuries earlier. Cavalry would become an important tool. In the Sicilian Expedition, led by Athens in an attempt to subdue Syracuse, the well-trained Syracusan cavalry became crucial to the success of the Syracusans. Macedonian Alexander the Great effectively deployed his cavalry forces to secure victories. In battles such as the Battle of Cannae of the Second Punic War, and the Battle of Carrhae of the Roman-Persian Wars, the importance of the cavalry would be repeated. There were also horse archers, who had the ability to shoot on horseback – the Parthians, Scythians, Mongols, and other various steppe people were especially fearsome with this tactic. By the 3rd-4th century CE, heavily armored cavalry became widely adopted by the Eastern Roman Empire, Sassanids, Eastern Han Dynasty and Three Kingdoms, etc. There were also organizational changes, made possible by better training and intercommunication. Combined arms was the concept of using infantry, cavalry, and artillery in a coordinated way. There was human oar power, often using slaves, built up to ramming speed. Galleys were used in the 3rd millennium BC by the Cretans. The Greeks later advanced these ships. In 1210 BC, the first recorded naval battle was fought between Suppiluliuma II, king of the Hittites, and Cyprus, which was defeated. In the Persian Wars, the navy became of increasing importance. In the First Punic War, the war between Carthage and Rome started with an advantage to Carthage because of their naval experience. A Roman fleet was built in 261 BCE, with the addition of the corvus that allowed Roman soldiers on board the ships to board the enemy ships. The bridge would prove effective at the Battle of Mylae, resulting in a Roman victory. The Vikings, in the 8th century CE, invented a ship propelled by oars with a dragon decorating the prow, hence called the Drakkar. The 12th century CE Song Dynasty invented ships with watertight bulk head compartments while the 2nd century BCE Han Dynasty invented rudders and sculled oars for their warships. In the 10th century, the invention of gunpowder led to many new weapons that were improved over time. Black powder was used in China since the 4th century, but it was not used as a weapon until the 11th century. Naval mines were invented in the 17th century, though they were not used in great numbers until the American Civil War. They were used heavily in the First and Second World Wars. Bayonets also became of wide usage to infantry soldiers. Bayonet is named after Bayonne, France where it was first manufactured in the 16th century. It is used often in infantry charges to fight in hand-to-hand combat. General Jean Martinet introduced the bayonet to the French army. They were used a lot in the American Civil War, and continued to be used in modern wars like the Invasion of Iraq. Also in the 1860s came the first boats that would later be known as torpedo boats. These were first used in the American Civil War, but generally were not successful. Several Confederates used spar torpedoes, which were bombs on long poles designed to attach to boats. In the later part of the 19th century, the self-propelled torpedo was developed. The HNoMS Rap was the world's first torpedo boat. On December 17, 1903, the Wright Brothers performed the first controlled, powered, heavier-than-air flight; it went 39 meters (120 ft). In 1907, the first helicopter flew, but it wasn't practical for usage. Aviation became important in World War I, in which several aces gained fame. In 1911 an aircraft took off from a warship for the first time. It was a cruiser. Takeoffs were soon perfected, but deck landings on a cruiser were another matter. This led to the development of an aircraft carrier with a decent unobstructed flight deck. Chemical warfare exploded into the public consciousness in World War I but may have been used in earlier wars without as much human attention. The Germans used gas-filled shells at the Battle of Bolimov on January 3, 1915. These were not lethal, however. In April 1915, the Germans developed a chlorine gas that was highly lethal, and used it to great effect at the Second Battle of Ypres. World War II gave rise to even more technology. The worth of the aircraft carrier was proved in the battles between the United States and Japan like the Battle of Midway. Radar was independently invented by the Allies and Axis powers. It used radio waves to detect objects. Molotov cocktails were invented by General Franco in the Spanish Civil War, directing the Nationalists to use them against Soviet tanks in the assault on Toledo. The atomic bomb was developed by the Manhattan Project and dropped on Hiroshima and Nagasaki in 1945, ultimately ending World War II. During the Cold War, even though fighting did not actually occur, the superpowers – the United States and the USSR – engaged in a race to develop and increase the level of technology available for military purposes. In the space race, both nations attempted to launch human beings into space to the moon. Other technological advances centered around intelligence (like the spy satellite) and missiles (ballistic missiles, cruise missiles). Nuclear submarine, invented in 1955. This meant submarines no longer had to surface as often, and could run more quietly. They evolved into becoming underwater missile platforms. Cruise missiles were invented in Nazi Germany during World War II in the form of the V-1. For more details on this topic, see Ancient warfare. Such items were also considered signs of prosperity or virtue, and thus were likely to placed in tombs and monuments to prominent warriors. And writing, when it existed, was often used for kings to boast of military conquests or victories. The earliest recorded battle in India was the Battle of the Ten Kings. The Indian epics Mahabharata and Ramayana are centered around conflicts and refer to military formations, theories of warfare and esoteric weaponry. Chanakya's Arthashastra contains a detailed study on ancient warfare, including topics on espionage and war elephants. Meanwhile, Rome was gaining power, following a rebellion against the Etruscans. During the three Punic Wars, the Romans defeated the neighboring power of Carthage. The First Punic War centered around naval warfare. The Second Punic War started with Hannibal's invasion of Italy by crossing the Alps. He famously won the encirclement at the Battle of Cannae. However, after Scipio invaded Carthage, Hannibal was forced to follow and was defeated at the Battle of Zama, ending the role of Carthage as a power. In 54 BCE the Roman triumvir Marcus Licinius Crassus took the offensive against the Parthian Empire in the east. In a decisive battle at Carrhae Romans were defeated and the golden Aquilae (legionary battle standards) were taken as trophies to Ctesiphon. The battle was one of the worst defeats suffered by the Roman Republic in its entire history. For more details on this topic, see Medieval warfare. For more details on this topic, see Gunpowder warfare. For more details on this topic, see Industrial warfare. Conscription was employed in industrial warfare to increase the number of soldiers that were available for combat. This was used by Napoleon Bonaparte in the Napoleonic Wars. For more details on this topic, see Modern warfare. However, it should be noted that modern militaries benefit in the development of these technologies under the funding of the public, the leadership of national governments, and often in cooperation with large civilian groups, such as the General Dynamics and Lockheed Martin corporations, in the United States. And as for "total war", it may be argued that it is not an exclusive practice of modern militaries, but in the tradition of genocidal conflict that marks even tribal warfare to this day. World War I was sparked by the assassination of Archduke Franz Ferdinand, leading to the mobilization of Austria and Serbia. The Germans joined the Austrians to form the Central powers; the French, British, and Russians formed the Allied powers. Following the Battle of the Marne and the outflanking attempt of both nations in the "Race to the Sea", trench warfare ensued, leaving the war in a great deadlock. Major operations by the Germans at the Battle of Verdun and by the British and the French at the Battle of the Somme were carried out, and new technology like tanks and chlorine gas were used. Following the USA's and the USSR's entrance into the war, the Germans and their allies were eventually defeated. World War II ensued after Germany's invasion of Poland, forcing Britain and France to declare war. Germany quickly defeated France and Belgium, later aided by Italy. A hasty evacuation occurred at Dunkirk to save the Allied army from complete destruction. The Germans then attacked USSR and marched to take over the Soviet resources, but were thwarted. Meanwhile, Japan, who had already been at war with the Chinese since 1937, had launched a surprise attack on Pearl Harbor, leading the United States to join the Allied powers. In Europe, the Allies opened three fronts: in the west, after securing Normandy; in the east, aiding the Soviet Union; and in the south, through Italy. Germany eventually surrendered, upon which the Allies turned and focused troops to do island hopping. The dropping of the atom bombs on Hiroshima and Nagasaki led to the surrender of Japan and the end of the Second World War. Worsening relationships between wartime Allies developed into the Cold War, reaching a climax during the Cuban Missile Crisis at the same time as the Sino-Indian War. Hostilities never actually occurred, though the US did kill in the communist states in the Korean War and the Vietnam War. ↑ Moerbeek, Martijn (January 21, 1998). "The battle of Salamis, 480 BC" Accessed May 16, 2006. ↑ Selby, Stephen (2001). "A Crossbow Mechanism with Some Unique Features from Shandong, China". Accessed on May 17, 2006. ↑ "Early Underwater Warfare". California Center for Military History. Accessed on May 18, 2006. Bucholz, Arden. "Hans Delbruck and Modern Military History." The Historian vol 55#3 (1993) pp 517+. "Web Sources for Military History"